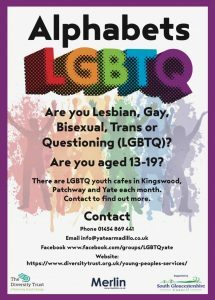 We manage specialist LGBTQ youth services in Kingswood, Patchway and Yate in South Gloucestershire, as well as a project in Glastonbury (Somerset), and LGBTQ youth support groups in partnership with Stonewater and Out of the Can in Swindon. 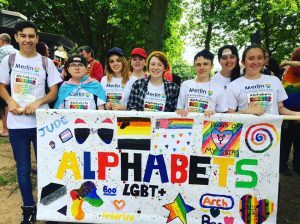 You can watch a film about Alphabets LGBTQ youth project on our YouTube Channel. Our LGBTQ youth projects are open to any Lesbian, Gay, Bisexual, Trans or Questioning (LGBTQ) young person between the ages of 13 and 19. Please use the Contact page to find out more about our youth services. We recommend the following support organisations for LGBTQ young people and their families.